Over the years, we have honed in on priority curricular units for every grade level, preschool through 12th grade, that build on each other and provide a meaningful food education for the students we work with. This Toolkit is the compilation of these units, along with their related teaching standards, activities, and assessment tools. We are constantly adding to this site, so please check in again soon for updates. 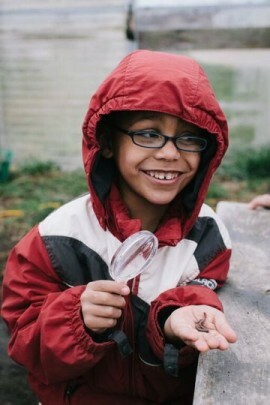 students follow the life cycle of a seed through literature, art and an introduction to the wide world of science. In the fall, students use their senses to observe plants as they begin to die back, collecting seeds and harvesting produce. During the winter, they explore the plant life cycle through stories, songs, art, and cooking activities. Once the weather warms, they use their knowledge to plant their own seeds in the garden, learning about community, friendship and the power of working together. What do living things need to survive? Where do seeds come from? Construct an argument supported by evidence for how plants and animals (including humans) can change their environment. Obtain information about the purpose of weather forecasting to prepare for, and respond to, different types of local weather. Communicate solutions to reduce the amount of natural resources an individual uses. Observe and communicate that animals (including humans) and plants need food, water, and air to survive. Animals get food from plants or other animals. Plants make their own food and need light to live and grow. Recognize that all plants and animals have a life cycle; a. most plants begin as seeds, develop and grow, make more seeds, and die; and b. animals are born, develop and grow, produce young, and die. Make observations to determine that sunlight warms materials on Earth’s surface. Use tools and materials to design and build a prototype of a structure that will reduce the warming effect of sunlight on an area. Describe the location of people, objects, and places, using correctly words and phrases such as up, down, near, far, left, right, straight, back, behind, in front of, next to, between. Put events from their personal lives, observations of the natural world, and from stories and informational texts read or read aloud in temporal order, using words and phrases relating to chronology and time. read aloud of characters who show authority, fairness, caring, justice, responsibility, or who show how rules are created and followed.